In Ho Chi Minh the NLF (National Liberation Front) was supported by the North. 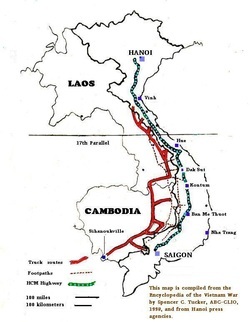 They sent supplies on a route starting in the North through Cambodia, Laos and behind into enemy territory in South Vietnam. These goods remained safe because the United States refused to fight on Cambodian or Laotian soil.